Bournemouth is one of Britain's most popular destinations and is a great place to enjoy some all-inclusive relaxation this winter with all your food and drink included. Bournemouth is one of Britains most popular destinations and is a great place to enjoy some all-inclusive relaxation this winter with all your food and drink included. We depart for your long weekend winter break from your front door with our exclusive home pick-up service, join your coach and travel to Bournemouth with comfort stops enroute. Tea/coffee awaits you on arrival, time to relax before dinner. Our excursion today takes us to the Isle of Purbeck and Swanage. Youll have time to explore Swanage and maybe take a stroll along the seafront before we make our way back to Bournemouth. Today we begin with a drive through the picturesque New Forest to delightful Salisbury with time to explore, obtain lunch and maybe visit the 13th century Cathedral with the tallest spire in England. 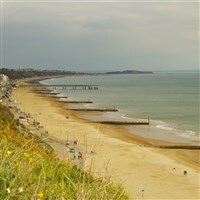 Return to Bournemouth in the afternoon, leaving time to perhaps take a stroll before dinner. This morning after breakfast we begin our journey home with comfort stops enroute. Free bar 6 - 9pm each evening (house brands only). The Suncliff stands on Bournemouths East Cliff and has panoramic views out to sea, yet just a short walk from the town centre. Bedrooms are comfortable and offer TV, telephone, hairdryer, tea/coffee making facilities the hotel also has an indoor pool and lift. Begin your short winter break with our exclusive home pick-up service, join your tour coach and travel to Bournemouth with comfort stops enroute. Tea/coffee await you on arrival, time to relax before dinner. Our excursion today takes us to the Isle of Purbeck and Swanage. Time to explore Swanage and maybe take a stroll along the seafront before we make our way back to Bournemouth. This morning we must bid farewell and begin our journey home with comfort stops enroute.